By the end of the roaring twenties, Boston's George B. Stone & Son had fallen behind the times. As the advent of talking movies was quickly killing off the Vaudeville-era drummer and the Great Depression was beginning to set in, Stone made one final attempt at innovation. In an effort to target the still thriving drum and bugle corps market of the early 1930s, the Stone Mastercraft drums were born. 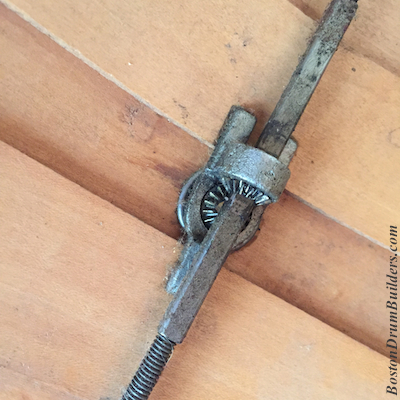 "A few years ago they brought out a "Mastercraft Drum" which is a patented innovation. 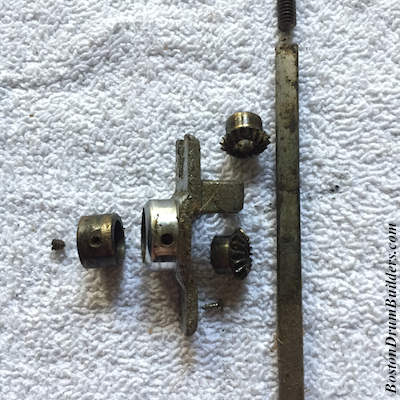 There are two pivots inside the shell to loosen or tighten the rods, which go inside instead of outside, thus eliminating some of the wear on the drum heads. The basis of the patent is the ventilation allowing moisture to come out. The Marlborough, Massachusetts, American Legion band with this kind of drum won the ninth prize offered at the Detroit Convention." Of particular interest here is the reference to the Marlboro Drum and Bugle Corps. 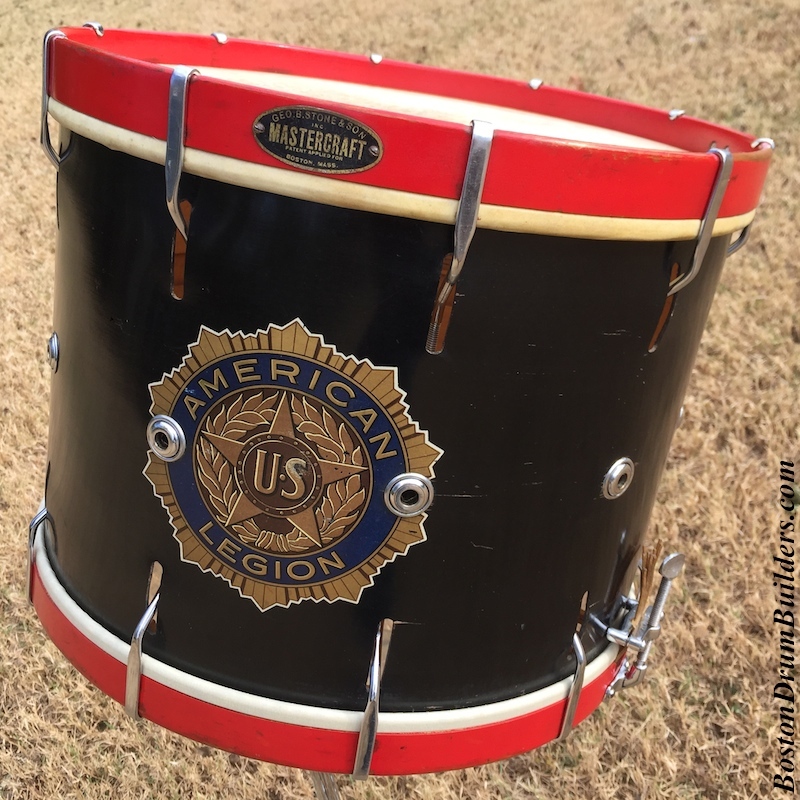 The Herbert F. Akroyd Post 132 American Legion Drum and Bugle Corps, to be more specific, was a powerhouse on the American Legion competition circuit through the 1930s with none other than George Lawrence Stone as drum instructor. Not surprisingly, the Corps purchased and performed on the new Stone Mastercraft drums. 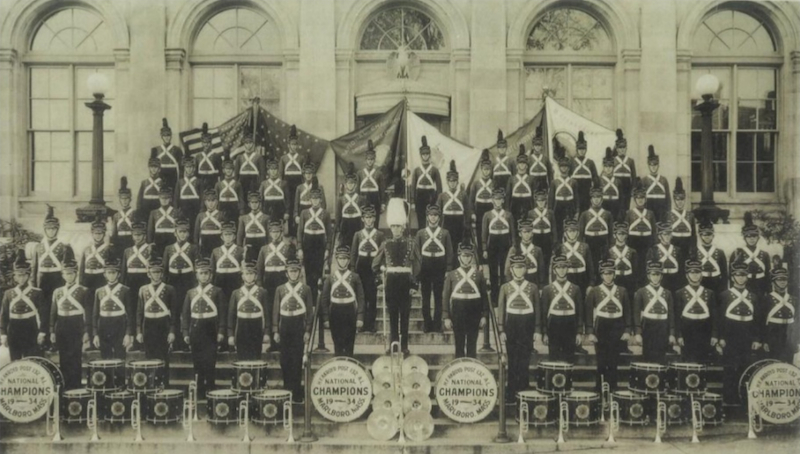 A 1934 photo shows the Corps with their instruments including no fewer than sixteen Mastercraft snare drums and four bass drums. Unfortunately there is no specific provenance attached to the drum featured at the top of this page though it is marked "7A" both inside the drum in strong black lettering, and on a small metal tag attached to the batter side counterhoop suggesting that the drum was part of a large set. Perhaps it could have been one of the drums used by the Marlborough Corps? Or could it even be the drum that George Lawrence Stone is photographed with below? 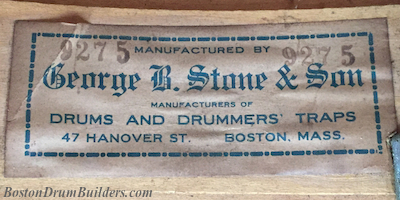 By the 1930s, George Lawrence Stone was positioning himself more as a teacher, author, and clinician than a drum manufacturer. To that end, Stone was pouring a great deal of time and energy into writing columns such as those for Jacobs Orchestra Monthly and the International Musician, and his regular teaching schedule at the Stone Drum School which he owned and operated in conjunction with his manufacturing company. He also was actively involved with the drum and bugle corps scene including his work with Marlborough. 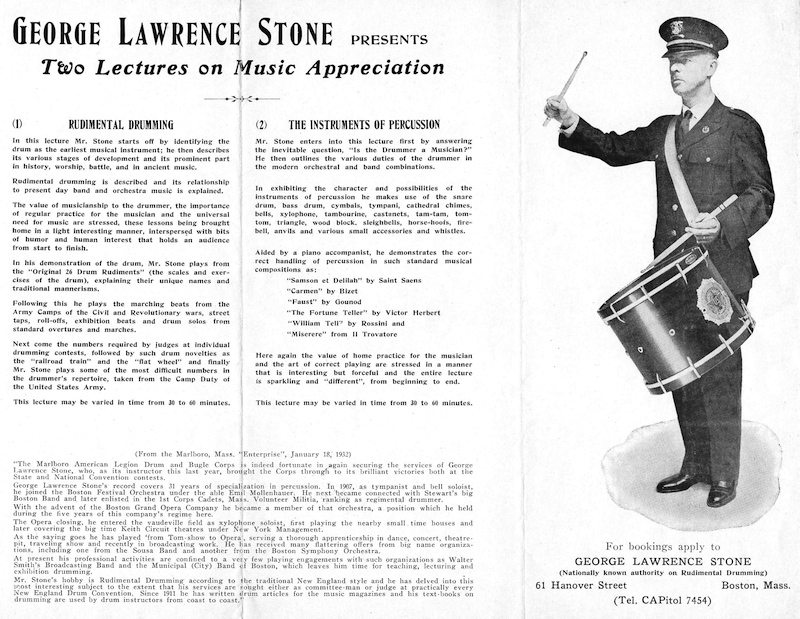 A flyer advertising Stone's "Two Lectures on Music Appreciation", one on "Rudimental Drumming" and the other on "The Instruments of Percussion", shows George Lawrence playing a drum nearly identical to the Mastercraft model featured here. 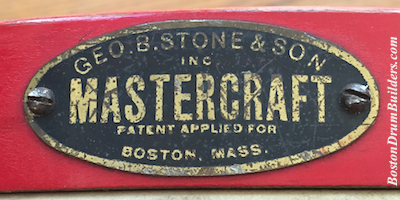 Contrary to what Ayars reports, Stone appears to never have received a patent for his Mastercraft drums. A patent application may well have been submitted, but no evidence exists to suggest it was approved and that a patent was granted. The wording on the badge is telling. It reads "PATENT APPLIED FOR". The Mastercraft drums employed a highly unconventional tuning system involving a system of gears inside of the drum which turned a square rod that then connected to claws reaching out from inside the shell and then around the wooden counterhoops. It was a very over-complicated way to achieve single tension meaning that both heads were tightened simultaneously and could not be tuned independently from one another. The design appears to have been best suited to large field drum and bass drum sizes as the gears and claws utilized on the Mastercrafts would not have been easily scaled down for shallower drums. That being said, there are reports of a 6.5" x 14" orchestra model in existence. In the pantheon of strange ways to tune a drum, the Mastercraft would have to rank near the top alongside WFL's "Victorious" wartime models and the Leedy & Ludwig knob tension drums of the early 1950s. And as innovative as the Stone Mastercrafts may have been, they don't appear to have done much to keep the family business afloat as Geo. B. Stone & Son's manufacturing interests withered through the 1930s and fizzled out completely not long afterwards. Surviving Mastercraft drums are scarce, and there is a good reason for that. The awkward tuning mechanisms are prone to jamming and removing a drum head requires that the entire drum be disassembled. Furthermore, as most Mastercrafts were aimed at the drum corps market, such groups tend to put a lot of wear on their instruments which likely meant that many of the Mastercraft drums were used until they were no longer serviceable and were then discarded. To find a complete example in good condition is a rare treat providing a valuable glimpse at George B. Stone & Son's last true attempt at innovation. Do you have a Geo. B. Stone & Son Mastercraft drum? I would love to hear about it! Drop Lee a note at lee@vinson.net. And for more on Boston's early 20th century drum makers, please visit BostonDrumBuilders.com.